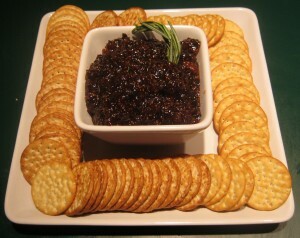 The amalgamation of sweet figs and aromatic rosemary makes for a wonderfully delicious and potent spread. I highly suggest you try this recipe, whether your looking for a delectable spread for toast for your morning breakfast , a sweet dessert filling, or a tasty spread to pair with crackers at a dinner party, this versatile jam like fig spread does it all! This recipe calls for sugar, the Eat To Live diet restricts sugar . What else can be used for a substitute? I too am confused with rose wine. Is it rose’ wine – as in a blush or red? This sounds great but I’m not sure what rose wine is. Is that the same as red wine? the rosemary fig spread sounds great. I am have a consultation tonight with her, I usually ask what they have in mind and I make suggestions and go from there. I come home and make each one of the dishes for the client to taste. Defintley try catering, it sounds like a fun challenge what would you make? I want to cater for a client but she is vegan is this something I should avoid since I have never catered vegan? It depends on the kind of sugar. Cane sugar is usually processed with bone char, but beet sugar isn’t. Most grocery stores now have unrefined sugar that is vegan. Look for Sugar in the Raw, turbinado sugar, and Florida Crystals. I’m confused, is regular store bought granulated sugar vegan? From what I’ve read, animal bones are used to help turn the sugar white. Is there any truth to this? I am wondering if the rosemary is fresh or dried? This looks beautiful and delicious. I can’t wait to try it.